2018 marks 50 years since the famous and indeed infamous events of 1968. From the assassinations of Martin Luther King Junior and Bobby Kennedy in the USA to the Tet Offensive in Vietnam to the crushing of the Prague Spring in Czechoslovakia, 1968 was a year punctuated by wars, riots, revolutions and all manner of social and political upheaval. Perhaps most iconically, May, 1968 witnessed a major uprising by French students and workers against Charles De Gaulle’s government, with barricades in the streets and walls dabbed with revolutionary slogans proclaiming everything from free love to the destruction of work. Across the world people questioned and challenged dominant forces and ideologies ranging from white supremacy to capitalism to authoritarian state socialism. For all the turmoil and subsequent disappointments of that year, ’68 still signifies a spirit of revolutionary fervour and a longing for social change. 50 years on such sentiments may seem utterly remote, as we daily tune into news of terrorist atrocities, racist violence, trade wars, Brexit negotiations and unrelenting austerity, with little hope on the horizon. Whereas students in ‘68 may have thought social, political and cultural revolution was on the cards within their lifetimes, for students at today’s British universities like Lancaster such possibilities might seem out of the question, especially for those more concerned with how their futures turn out in an uncertain climate. If you are lucky, attending university proves a rather expensive yet fun 3-4 years of personal investment on the way to a career of your choice. If you are unlucky it can be just another item on your CV as you struggle through a world of debt, rent and grim jobs, potentially even trapped within a state of what the Young Women’s Trust have called “suspended adulthood,” where independence from one’s parents simply proves unaffordable. Whereas the students of ‘68 may have had time for political rebellion and countercultural experimentation, in today’s increasingly marketised universities students’ personal stakes are in many cases just far too high for them to do the same. Better to just focus on studying hard and getting that prized degree, whatever one’s personal stress and strife. The world around us might descend into ever greater chaos but we might be able to get through individually. Let’s just leave all that student rebellion back in ‘68 with Dad’s old Beatles LPs and Mum’s hippy scarves. Should we dismiss the past so much though? Do the experiences of ’68 really have nothing to offer present students? In dark times like this we feel that it is worth considering the history around us at this very University if we want to think through these questions. For Lancaster University’s own past, buried beneath years of glossy marketing and endless campus redevelopment, can itself be seen as bound up with the spirit of ‘68 and the hopes of students for radical change over subsequent decades. Lancaster University itself was a product of the 1960s expansion of Higher Education institutions, with the new university soon affected by the rebellious zeitgeist of the times. In ‘68 the University was rocked by a scandal over the issue of mixed gender accommodation, with newspapers expressing moral outrage over a proposal for Cartmel accommodation to be mixed gender and for unmarried couples to be allowed to sleep in the same rooms. The proposer of such policies, Dr David Craig, would later in 1972 face persecution by the heads of the English literature department on account of apparent left wing bias when doing his job, with students protesting and occupying the university in response. The early decades of the university witnessed activism against white supremacy in Rhodesia, American involvement in Vietnam and the Bloody Sunday massacre in Northern Ireland, alongside the growth of gay and women’s liberation groups over the 1960s-1970s, with Women’s Studies becoming a taught subject and various gay liberation conferences and demonstrations taking place on campus. In his exploration of the British counterculture ‘A Hero For High Times’ Lancaster alumni Ian Marchant notes how this radical and countercultural spirit continued well into the early 1990s, with Marchant encountering various Trotskyists, peace activists, spiritualists and ravers during his time spent in the Nelson Mandela Coffee Bar as a mature student. This rebellious spirit has carried on through to the 21stC, with the George Fox 6 – a group of protesters who were convicted in September 2006 for disrupting a corporate event in the George Fox building – against University support for the arms trade. A local demonstrations against tuition fees in 2010 and the 2014 occupation of university house against campus fee and rent increases notable examples of Lancaster students continuing to campaign against injustice. This past year’s student support for striking staff and student action opposing extended late teaching hours offer the most recent cases of Lancaster students organising to make a positive difference. This archive of dissent is worth remembering at a time when students are ever more encouraged to act as consumers of “the student experience.” There are of course risks in engaging in easy nostalgia, but we would argue that these past experiences of struggle offer today’s indebted, anxious and insecure students possibilities for imagining better worlds and futures beyond those offered by contemporary university life. In a world dominated by the notion that “there is no alternative” to contemporary capitalism and its numerous inequalities and injustices, what the late cultural critic Mark Fisher called “capitalist realism,” drawing inspiration from the struggles of the past can help us to rediscover the possibilities for social change beyond the dire conditions of the present. It is not as if struggles for liberation and justice in universities are mere relics of a past age. 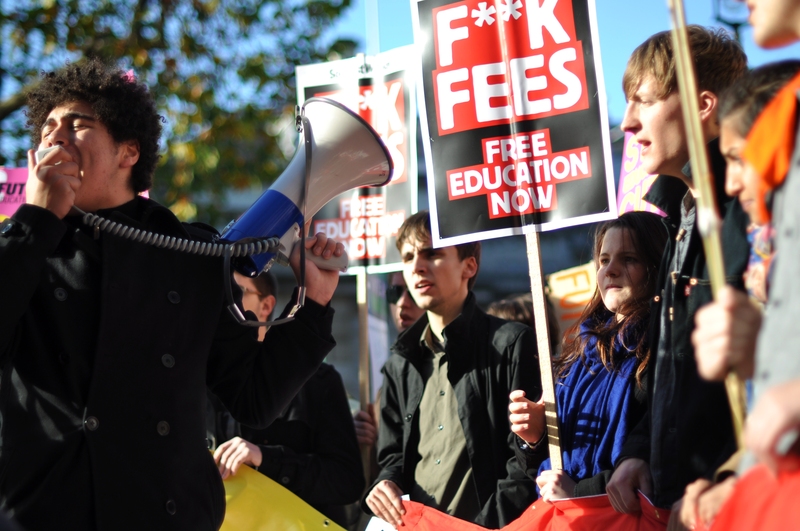 The fact that British universities like Lancaster continue to invest in destructive fossil fuels and arms companies, monitor international students as part of the Home Office’s hostile environment, attack the pay and pensions of staff and demand ever higher fees and rents from students clearly show that there are clearly plenty of injustices comparable to those of ‘68 for us to be angry about. The world is indeed in a terrible state and even challenging the injustices at a university campus may seem a daunting task. Through collective action and solidarity however we can still find ways of enacting changes for the better, as our predecessors at this university strove to do for over half a century.